Those who braved the SteamOS Beta installation process may, just may, get the chance to listen to tunes while playing games on Valve's operating system. 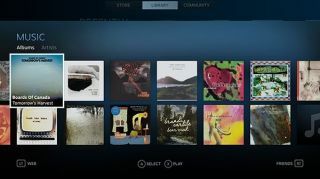 The company made a stealthy announcement that it's launching Steam Music Beta for the OS and Big Picture, letting lucky invitees listen to their music collection as they take on titles. Valve isn't opening Music up to everyone yet; interested parties will have to "express interest in beta participation" by joining a dedicated community group. Members will be invited "in waves, until the feature is released to everyone." Steam Music users will have to point Steam to their local music directory, after which the Steam Library will pull up Album and Artist views of their music collection. Once that process is complete, users can access Steam Music through their Steam Controller (or keyboard and mouse), manage their music queue and view and play tracks. When playing a game, Music will follow users through the Steam overlay, allowing them to continue managing their playlist, browse and select songs. Valve has made no secret that it wants SteamOS to be more about playing games; when it was first announced in September 2013, the company mentioned music, TV and movies would also be part of the picture. Steam Music sounds fairly limited for now in function as well as pool of users. However, it's a step in the right direction as Valve looks to bring PC gaming to the living room, and is one more feature Steam Machine users should find appealing. We have one Steam Machine review for you right now!